For those of you who regularly read my blog, I'm sure you have wondered if I still exist, considering I haven't posted a new article in about a year and a half. Well, I'm still alive and hope to get back to putting up more articles defending Joseph. Thank you for being so patient in my posting absence. 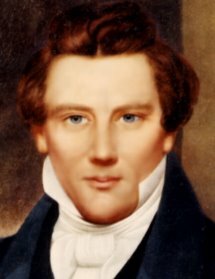 Several years ago I posted a blog article entitled, “Did Joseph Smith, Jr. make improper advances toward Sarah Pratt?” According to John C. Bennett's accusations against Joseph, which were printed in the Wasp Extra (July 27, 1842) and the Sangamo Journal (July 15, 1842), while Sarah Pratt's husband, Apostle Orson Pratt, was in the British Isles (between 1839 and 1841 according to Wikipedia), Joseph propositioned her to be his polygamous wife and she flatly and indignantly refused him. When Joseph III visited Utah in 1885, he interviewed Sarah Pratt to find out from her directly (a primary source) if Bennett's accusations were true. The essence of my previous blog post was to relate Sarah's interview as recorded by Joseph III (The Memoirs of President Joseph Smith III [1832-1914], 226). Her statement to him indicated that Joseph Smith Jr. never made such a proposition to her, which refuted Bennett's 1842 accusations. However, since the time of my previous article, I've read portions of the book Mormon Portraits, by Wilhelm Ritter von Wymetal, published in 1886 by Salt Lake City Tribune Printing and Publishing Company. This is an “exposé” on Mormonism with a volume dedicated to the subject of ”JOSEPH SMITH, THE PROPHET, HIS FAMILY AND FRIENDS.” In this volume is recorded Wymetal's interview with Sarah Pratt regarding her relationship with Joseph Smith Jr. and her comments about her interview with Joseph III a year earlier when he visited her in Utah. It seems that Sarah Pratt's statement to Wymetal was totally different than what Joseph III reported. In addition, her statement to Wymetal about her relationship to Joseph Smith Jr. corroborated John C. Bennett's statements printed in the Wasp Extra (July 27, 1842) and the Sangamo Journal (July 15, 1842). On the surface this gives credibility to her statement to Wymetal that Joseph Smith Jr. propositioned her and brings doubt as to the truthfulness of her statement to Joseph III. The purpose of this blog post is to determine which of Sarah Pratt's statements are true—the one given to Wymetal or the one given to Joseph III. However, before we can honestly analyze the truthfulness of her statements, we need to discuss the probability that either Wymetal or Joseph III lied about what Sarah Pratt told them. Wymetal had "no dog in the fight" so to speak. He was a disinterested party. As a freelance reporter for various newspapers, the story that Joseph Smith Jr. was innocent of propositioning Sarah Pratt would have been as newsworthy, if not more so because of popular belief, as the one he actually reported. Based on no real motive to lie, I have to believe Wymetal actually reported what Sarah Pratt told him. On the other hand then, did Joseph III lie? Some would say that he certainly had motive to do so. However, I don't believe he did. Having an RLDS background, some might think that I’m biased to believe Joseph III, and maybe I am. But if I am, it is because he was known in my church, as well as the community, as a man of impeachable integrity and honesty. His belief about polygamy was that it was wrong, even if his father had practiced it. While he hoped that his father hadn’t done so, the point of his many investigations about his father’s activities was to find the truth. Because Joseph III’s religious beliefs didn’t rest upon whether or not his father was a polygamist, he was open to any evidence proving his father guilty of polygamy. I believe that if Sarah Pratt told him—after some intense cross-examination to get to the truth—the same story that Wymetal reported, Joseph III would have relayed it exactly as she told it. The fact that he always sought the truth about his father is the reason I believe he correctly reported what Sarah Pratt told him. Thus, I believe both men accurately reported what Sarah told them. They didn't change her story—she did! So here are her conflicting stories. When my husband went to England as a missionary, he got the promise from Joseph that I should receive provisions from the tithing-house. Shortly afterward Joseph made his propositions to me and they enraged me so that I refused to accept any help from the tithing-house or from the bishop. Having been always very clever and very busy with my needle, I began to take in sewing for the support of myself and children, and succeeded soon in making myself independent. When Bennett came to Nauvoo, Joseph brought him to my house, stating that Bennett wanted some sewing done, and that I should do it for the doctor. I assented and Bennett gave me a great deal of work to do. He knew that Joseph had his plans set on me; Joseph made no secret of them before Bennett, and went so far in his impudence as to make propositions to me in the presence of Bennett, his bosom friend. Bennett, who was of a sarcastic turn of mind, used to come and tell me about Joseph to tease and irritate me. One day they came both, Joseph and Bennett, on horseback to my house. Bennett dismounted, Joseph remained outside. Bennett wanted me to return to him a book I had borrowed from him. It was a so-called doctor-book. I had a rapidly growing little family and wanted to inform myself about certain matters in regard to babies, etc., -- this explains my borrowing that book. While giving Bennett his book, I observed that he held something in the left sleeve of his coat. Bennett smiled and said: “Oh, a little job for Joseph; one of his women is in trouble.” Saying this, he took the thing out of his left sleeve. It was a pretty long instrument of a kind I had never seen before. It seemed to be of steel and was crooked at one end. I heard afterwards that the operation had been performed; that the woman was very sick, and that Joseph was very much afraid that she might die, but she recovered. You should bear in mind that Joseph did not think of a marriage or sealing ceremony for many years. He used to state to his intended victims, as he did to me: “God does not care if we have a good time, if only other people do not know it.” He only introduced as marriage ceremony when he had found out that he could not get certain women without it. I think Louisa Beeman was the first case of this kind. If any woman, like me, opposed his wishes, he used to say: “Be silent, or I shall ruin your character. My character must be sustained in the interests of the church.” When he had assailed me and saw that he could not seal my lips, he sent word to me that he would work my salvation, if I kept silent. I sent back that I would talk as much as I pleased and as much as I knew to be the truth, and as to my salvation, I would try and take care of that myself. Because Sarah Pratt's statement to Wymetal is so similar to John C. Bennett's published articles about Joseph and Sarah in 1842, it is impossible to evaluate the truth of her statement to him without briefly discussing Bennett's morality and veracity as well as his relationship with Sarah Pratt. These two attributes of Bennett's character are well discussed in Chapter 7, Chapter 8, Chapter 11, Chapter 14, Chapter 15, and Chapter 16 of Joseph Smith Fought Polygamy—Volume 1 and I suggest a review of these chapters before continuing on. Regardless of an author's position on whether or not Joseph was a polygamist, most if not all will agree that John C. Bennett was a serial adulterer and liar. Thus, the fact that Sarah Pratt's statement to Wymetal was very similar to Bennett's published articles brings into question the truth of what she told Wymetal. In addition, the truth of her statement to Wymetal is further called into question considering her relationship with Bennett. Both the chapter entitled “The Sarah Pratt Case” in Joseph Smith Fought Polygamy (Volume 2) and chapter 21 of Joseph Smith's Polygamy (Volume 1) by Brian C. Hales strongly indicate that Sarah Pratt and John C. Bennett had an extramarital affair during the time that Joseph supposedly propositioned Sarah. According to Hales, "evidence indicates that she and John C. Bennett experienced a sexual relationship while Orson [Pratt, her husband,] was in England. Joseph Smith intervened and was afterwards accused by Sarah of making an improper proposal" (Brian C. Hales, Joseph Smith's Polygamy 1:235). Both sources indicate that there were several credible witnesses who made affidavits that Sarah and Bennett were having and extramarital affair. The evidence was strong enough to try them in Church court and find them guilty. John C. Bennett was expelled from the Church on May 11, 1842, for his affair with Sarah Pratt, as well as other sexually immoral activities (Joseph Smith Fought Polygamy, Volume 2, chapter 5). Sarah Pratt was excommunicated from the Church on August 20, 1842, for adultery with John C. Bennett (Brian C. Hales, Joseph Smith's Polygamy 1:584). The actions by the Church court indicate that the allegations by Bennett against Joseph in the Wasp Extra (July 27, 1842) and the Sangamo Journal (July 15, 1842) and later by Sarah Pratt to Wymetal were untrue and merely an attempt to cover-up their affair by publicly accusing Joseph of propositioning Sarah. And except for the recent investigative work on this subject by various authors, it seemed to have worked. Keep in mind that the Church court proceedings (including testimony) were private and not reported to the public, so in essence Sarah's and Bennett's affair was kept secret. On the other hand, Bennett's allegations in the newspapers, as well as Sarah's statement to Wymetal, were public statements. From Joseph III's interview with Sarah Pratt, it is evident that the prevailing public story about Joseph Smith Jr. and Sarah Pratt was that he made improper advances toward her—not that she and Bennett had an extramarital affair. To my knowledge, the only statements Sarah ever made regarding this event was to Joseph III and to Wymetal. Which Story Are We to Believe from Sarah Pratt—Wymetal's or Joseph III's? I believe Joseph III's interview with Sarah is the truth. First, based on the evidence, I believe that Sarah Pratt and John C. Bennett had an extramarital affair, which indicates Bennett lied to the press and Sarah lied to Wymetal. Since Bennett was a proven serial liar, lying about this issue would not be out of character for him. Furthermore, in Sarah's statement to Wymetal, I could find no date that the event occurred or, in particular, where it occurred. In addition, John C. Bennett’s 1842 letters published in the press, which were the first public announcements of this alleged event, made no mention of these facts either. I find it peculiar that such a repulsive proposition from the Prophet to Sarah, who was married, did not impress upon her the date of the event or the circumstances surrounding it. Traumatic events like these do not flee our memory and when we relate them, we tell the events surrounding the traumatic one. The absence of this detail in her testimony to Wymetal is another reason I do not believe she told the truth to him. Second, while her affair with Bennett was known in Church court proceedings as early as 1841 (see Chapter 3, “The Sarah Pratt Case,” in Joseph Smith Fought Polygamy, Volume 2), she made no public statement of the alleged proposition from Joseph at that time. You would think that when all of this erupted in Nauvoo in 1841 about Bennett and her, she would have set the record straight that it was Joseph, not Bennett, who was being improper with her. She evidently told Orson this version and if it was true, why not make it public to save herself from adultery charges and support Orson who supported her? Third, why would a woman who was so repulsed by such a proposal from Joseph endure years of her own husband's (Orson Pratt’s) polygamy? Why wouldn’t she be just as repulsed, if not more so, by her husband taking additional wives and living the principle for many years? According to the Jared Pratt Family Association Web site, Sarah and Orson were married July 4, 1836, and had twelve children together. Orson took four additional wives in Nauvoo beginning in 1844 and was married to five others by 1868—the year Sarah divorced him, according to Wikipedia. If she wasn’t repulsed by the principle enough to prevent her from living in polygamy for many years with a total of nine other wives and giving birth to twelve of Orson's 45 children, she wouldn’t have been so repulsed by Joseph’s alleged proposition. For these reasons, I believe Sarah Pratt lied to Wymetal and told the truth to Joseph III. So Why Did Sarah Lie to Wymetal? Maybe she had second thoughts about having told Joseph III the truth, and when Wymetal came along a few years later, she took that opportunity to counter what she had told Joseph III. It was one thing for her to stand against polygamy in Utah, but totally another to reveal that church leaders had lied about this event with Joseph. Or, maybe after her interview with Joseph III, she realized that if the truth got out that this event never happened between Joseph Smith Jr. and her, the issue of her affair with Bennett might resurface. And in Utah, at the time, while polygamy was acceptable, adultery was not. Or maybe, since she was divorced from Orson and was involved with helping women come out of polygamy, she couldn't afford to give up her reputation as the one woman who was strong enough to refuse the advances of the Prophet Joseph Smith Jr. If Joseph III published her interview, she could loose that reputation. Her interview with Wymetal could have been just damage control in case her interview with Joseph III was published. However, the fact of the matter is that I don’t know why she lied to Wymetal, and without evidence, any attempt to provide a reason is pure speculation on my part. But whatever it was, I'm sure she had a reason since the version she gave to Wymetal was so different. I suddenly found myself, after my evening devotions, in a room where my mother was. It is just as literal and real to me as I see you people this afternoon. It was a two-story house such as we frequently see, about sixteen by twenty-four, without a division in the center; upon the one side at the end was her stove, and right over at the other side was her table, and next the door to the right was the chair where I sat. Mother had just got her dishes done and had wrung out her dish cloth and hung up her pan against the wall as you women folks do, you know, and she had taken her side comb out of her hair and combed her hair as they did in the old-fashioned way. She took some hair down on either side of her face and rolled it up and stuck a pin through it — you’ve seen it done, many of you. She took off her apron that she had been using and put on a clean one, drew the white handkerchief like some of you used to wear, across her breast and sat down on the chair and said to me, “Now Joseph, your father is here and you can ask him the questions that you have been asking me, to see whether I have been telling you the truth or not.” Now, remember, mother died as I told you awhile ago, aged seventy-four, with all the marks of age upon her; and as she sat in that chair, she was as I remember her to have been when she was about thirty-five years of age. All that she seemed to have lost was restored to her. I did not mark it at the time, but when she spoke of my father, I turned to the left and there, on an old-fashioned settee, I saw my father. In my estimation father presented an appearance more matured than when I saw him last; he was an older man, such as he might have been had he lived to be forty-two. That is my understanding of it. I turned and asked him the question, “Father, do you know what mother and I have been talking about?” He said, “Yes, my son, I do.” Are you prepared to answer the question whether she has told me the truth or not? “I am.” What is your answer? “You may depend upon it that your mother has told you nothing but the truth” (Infallible Proofs, 67-68; Zion’s Ensign, December 22, 1894, in sermon on “Future Conditions”).